Maggie’s back and Sasha and Rosita bury the hatchet. The episode began rather ominously with the return of the Hilltop to our screens who were preparing themselves for the biggest fight any of them had ever experienced. Amongst all the war prep, we’re reminded that Maggie (Lauren Cohan) is pregnant, which I’d forgotten since we haven’t seen her for a while and it’s not really mentioned. The nurturing mixed in with the animosity of war is interesting to see, almost as if to prove that Negan will not disrupt their lives. My only criticism so far is that The Walking Dead now has so many characters in so many different communities that I’m forgetting who’s where. All of a sudden, someone storms through the gates and makes a beeline to Sasha. Not surprisingly, it’s Rosita (Christian Serratos). These two characters make an extremely unlikely duo, they’re at each other’s throats all the time but they’re both tough and know how to look after themselves. 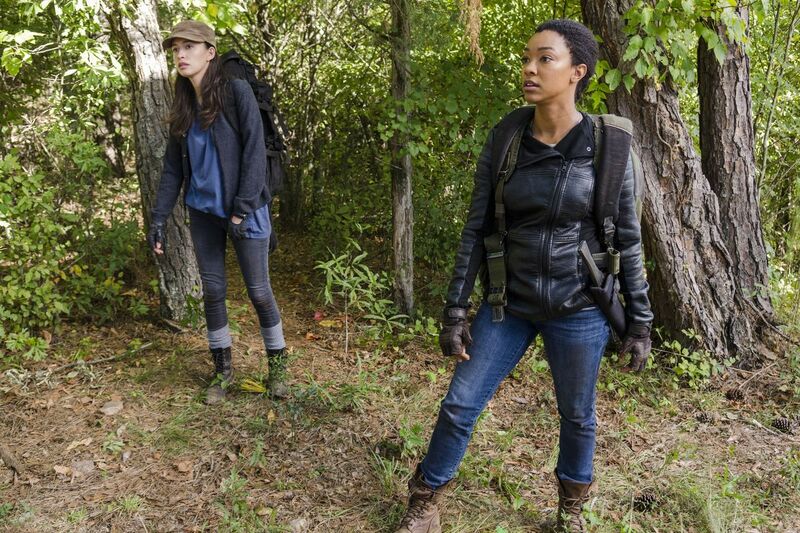 Sasha (Sonequa Martin-Green) and Rosita make their escape quickly when the Saviours arrive. On their travels, they looked a little bit hesitant, possibly because they know there’s a good chance that neither of them will return. They seem to be getting on well, until Rosita sees that Sasha is wearing Abraham’s necklace. This obviously hurts Rosita but as always she doesn’t let her emotions show and just powers on. Sasha devises a plan which sees them remaining outside of Negan’s compound, killing him from a vantage point. This would definitely give them a higher chance of survival but Rosita refuses straightaway. She wants to go right into the compound but surely that would mean certain death? When they eventually arrive at Negan’s walls, they find a high-rise building and camp out on the top floor. Like I was, both women are shocked to learn that Eugene has been put in charge. Rosita and Sasha then share a tender moment, with Rosita revealing how much she really did love Abraham. Tears shed and the feud put to bed, Sasha checks for Negan outside and there he is. I was gripped, wondering whether Sasha would shoot anyway, even though she couldn’t get a clean shot. It turns out she didn’t so plan B was to get inside. As night fell, they cut their way in and made quite a lot of noise in the process. However, a surprising turn of events saw Sasha lock Rosita out and tell her that it’s not her time. As much as this was done in the best intentions, Rosita is mortified. Meanwhile, back at the Hilltop, Gregory is dealing with the army of Saviours that had invaded. Enid hides Maggie and Daryl in the pantry and they hide out there until the storm passes. Just the two of them in the basement, the atmosphere is awkward and we understand why when Maggie asks Daryl (Norman Reedus) why he still hasn’t spoken to her. It’s quite a heart wrenching scene when Daryl expresses the guilt he feels over Glenn’s death but Maggie is quick to assure him that it was definitely not his fault. No one is entirely sure what the Saviours want from the members of the Hilltop but it’s soon revealed that Negan is after another Doctor. Dr Carson tries to protest but we all know by now that what Negan wants, Negan gets. Let’s just hope he doesn’t meet the same grisly end. Jesus also has a run in with Gregory which gets heated. I’m really starting to enjoy the character of Jesus and there’s a lot to be explored there. Upon leaving Gregory’s office, Jesus runs into Daryl who demands to know where Sasha and Rosita are. 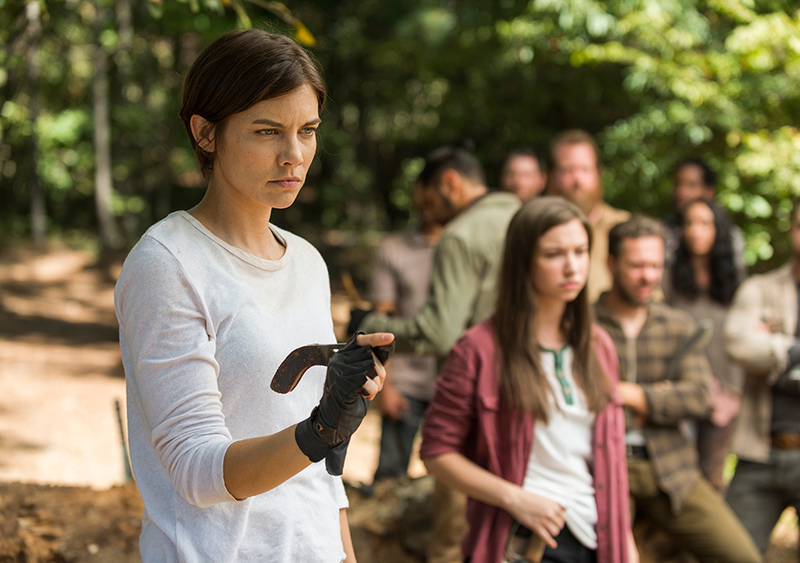 The episode ends with Rosita alone trying to figure out what to do after Sasha has run into Negan’s compound, while also faced with a silhouetted figure approaching with a crossbow – which can only mean trouble. Overall, I enjoyed the episode. It’s setting up a lot of enigma’s: What is Sasha going to do now she’s inside? And will Daryl go after her or not?